China warned the United States on Friday that it was "not afraid of a trade war" as it threatened tariffs on $3 billion worth of US goods in retaliation over President Donald Trump's moves against Chinese imports. Beijing unveiled a hit list of products that could face duties of up to 25 percent, from fresh fruit to pork and wine, though it stopped short of pulling the trigger as it indicated its readiness to negotiate an agreement. The Dow Jones Industrial Average plunged more than 700 points, while Tokyo closed 4.5 percent lower, Hong Kong fell 2.45 percent and Shanghai sank more than three percent. The action did not immediately impose any new tariffs, but within two weeks US Trade Representative Robert Lighthizer is due to publish a list of the products that could be hit with tariffs. US Commerce Secretary Wilbur Ross on Thursday suggested the new measures on intellectual property were a way of bringing Beijing to the table, telling CNBC they were "the prelude to a set of negotiations". But a senior US official later said that Washington was "not interested in creating terms for a dialogue". "We are interested in creating some motivation for China to actually take concrete actions to further open their markets to US exports," the official said on condition of anonymity, adding that the two sides are constantly talking. China's commerce ministry warned that a 15 percent tariff on 120 goods worth almost $1 billion -- including fresh fruit, nuts and wine -- would be imposed if the US fails to reach a "trade compensation agreement" within an unspecified timeframe. In a second step, a 25 percent tariff would be imposed on eight goods totalling nearly $2 billion, including pork and aluminium scrap, after "further evaluating the impact of the US measures on China", the statement said. The measures were specifically in response to US steel and aluminium tariffs, which were taking effect Friday. The list noticeably does not include soybeans, a key US export from Trump-voting states that Chinese state-run newspaper the Global Times had suggested should be targeted by Beijing. Betty Wang, an economist at ANZ bank, said China's reaction is "relatively mild". Senior White House economic advisor Everett Eissenstat said the new duties would target sectors where "China has sought to acquire an advantage through the unfair acquisition or forced technology transfer from US companies." Lighthizer indicated the industries could include aerospace, maritime and rail transport equipment, and new energy vehicles. The order also directs the US Treasury to develop new proposals to increase safeguards against Chinese investments in the US that could compromise national security. In addition, the United States launched a challenge at the World Trade Organization on Friday, saying in a statement that China appears to be breaking WTO rules by denying foreign patent holders rights "to stop a Chinese entity from using the technology after a licensing contract ends". The senior US official said Washington was "very optimistic" that allies such as Europe, Japan and Australia would join its WTO case. While Trump hit out at China, he authorised the suspension of steel and aluminium tariffs on key trade partners -- including the European Union and six other countries -- until May 1. But the EU said it would "reserve its rights" to impose countermeasures as long as the exemption remained temporary. The United States had a record $375.2 billion goods trade deficit with China last year. 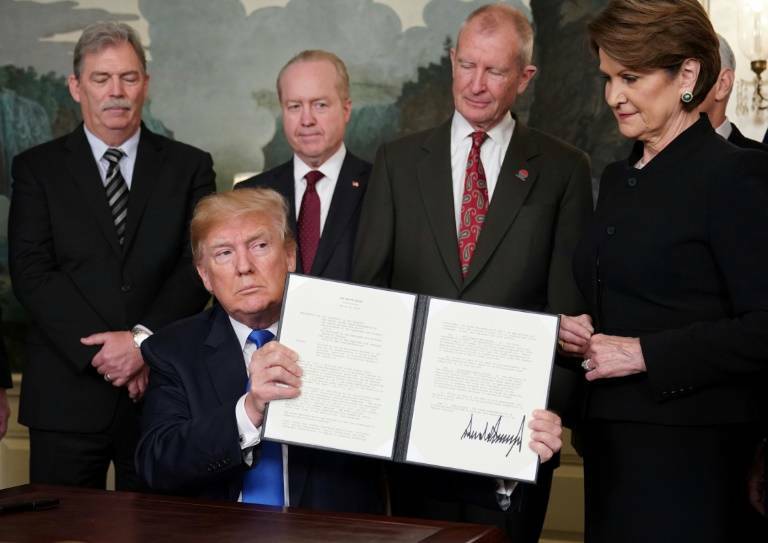 American industry, agriculture in particular, as well as members of the president's own Republican party have voiced strident opposition to his recent trade moves. Influential Republican Senator Lindsey Graham said he was "very pleased" with the moves, but other Republicans called on Trump to be judicious in designing the tariffs, warning of consequences for American consumers. 0 Response to "China threatens US with tariffs, says 'not afraid of trade war'"